Please re-read that headline so you don't misread it by skimming. We have reached the point where BENEFITS (not wages) for federal workers is fast approaching WAGES of the private worker. 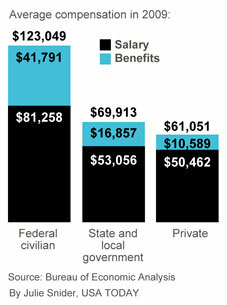 Again before we move one step forward let's emphasize what we see... BENEFITS for the federal worker average $42K. WAGES for the private sector worker average $50.5K. With inflation in healthcare (8-10%+ many years) I expect these two trendlines to cross within 5-7 years. Long time readers know I've been far in advance on this subject versus the mainstream press; indeed saying this will become one of the main social stresses in American society as globalization continues to attack the private sector, while the public lives in a parallel universe. We said the states - dependent on bubble levels of real estate and spending like there is never a rainy day would be facing problems long before it was fashionable. [Dec 16, 2007: California in a State of Fiscal Emergency - Coming to a Theater Near You] Indeed even with the worst recession since the Great Depression, it took some 18-24 months before any stresses developed in the public sector - and almost all of that is at the city and state level, due to the need to balance budgets. At the federal level there is no such need, hence a superstar caste has developed in the U.S.
Now to be fair, I would say some small portion of federal government worker is UNDERpaid versus their private sector peers, especially those who direct large departments. And a much larger % of the private sector (vs public) is lower paid blue collar and/or "grunt service work" so that skews a 40,000 foot view analysis. But in the past year other stories have compared apples to apples, showing a large discrepancy in nearly identical jobs (i.e. accounting) between public v private. And that was in wages alone, before the benefits came into play. This is old hat for long time readers of FMMF, but judging by the comments section in these newspaper stories it seems more and more Americans are discovering this issue for the first time. As the economy has years of "meh" ahead of it, I expect it to raise more and more ire as the dichotomy only grows. Ironically of all papers, USA Today has been leading the charge with multiple stories the past 6 months - you'd think a far more erudite newspaper would be doing the dirty work. Just another day in Ponzidise Paradise. At a time when workers' pay and benefits have stagnated, federal employees' average compensation has grown to more than double what private sector workers earn, a USA TODAY analysis finds. Federal workers have been awarded bigger average pay and benefit increases than private employees for nine years in a row. The compensation gap between federal and private workers has doubled in the past decade. Federal civil servants earned average pay and benefits of $123,049 in 2009 while private workers made $61,051 in total compensation, according to the Bureau of Economic Analysis. Benefits. Federal workers received average benefits worth $41,791 in 2009. Most of this was the government's contribution to pensions. Employees contributed an additional $10,569. Pay. The average federal salary has grown 33% faster than inflation since 2000. USA TODAY reported in March that the federal government pays an average of 20% more than private firms for comparable occupations. The analysis did not consider differences in experience and education. Total compensation. Federal compensation has grown 36.9% since 2000 after adjusting for inflation, compared with 8.8% for private workers. What does an unbiased source say about the subject? "The data are not useful for a direct public-private pay comparison," says Colleen Kelley, president of the National Treasury Employees Union. I believe Colleen is using the Stephen Colbert defense... when facts get in the way, dismiss them.